If you’ve been around Camp Kiddo for a while, then you already know all about our conflicted stance on The First Birthday. On the one hand….your child is ONE, my friends. Will they reeeeeally remember (or even care?) that you personally captured marzipan owls from the sugar plum forest and handcrafted 73 different types of petit fours to replicate an authentic Parisian patisserie for the dessert table? Mmm. Prolly not. Then again, HALLELUJAH sistah! you made it past the first year raising your beloved child and YOU DESERVE TO HAVE AN AWESOME BLOWOUT TO COMMEMORATE A YEAR OF NO SLEEP AND POOPY DIAPERS! 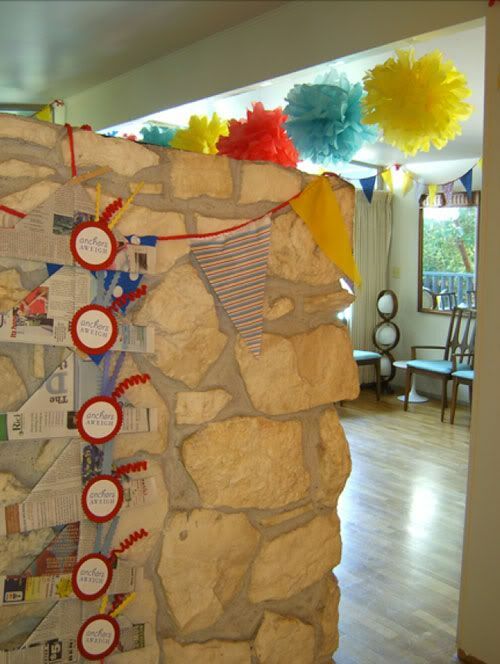 We like to think of the First Year Birthday Party as more an homage to the parents. And frankly, I can’t resist a good party…soooooo guess what? 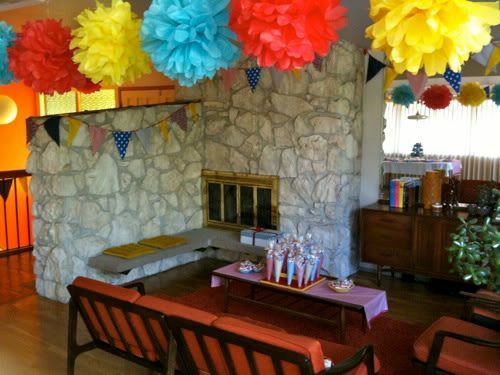 We’re going to check out some awesome little parties today. Whoo hoo! First up? Sebastian’s Spectacular Sailor birthday. I feel like parent’s of boys need to be even more creative than girls when it comes to parties. For some reason most people think little boys are all about dump trucks and dinosaurs and little girls get most of the sassy SWAG. That’s why I was totally head over heels when I saw this little man’s gorgeous fete over at Twig and Thistle. Sebastian’s mother is graphic designer extraordinaire, Katie Phipps. 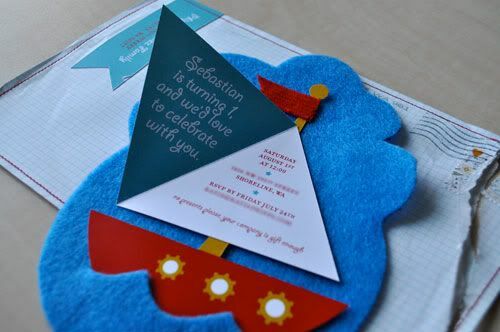 I thought this little crafty invite was just amazing. 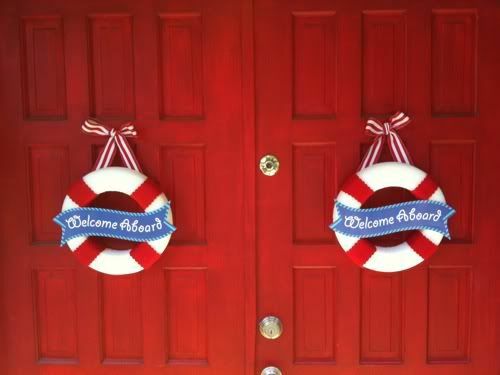 Ahoy matey….the lovely Katie made all the decorations herself. I love the nautical flag banners and thought the simple newspaper hats were crazy charming (and who doesn’t love to wear a fun paper hat, I ask ya?). Hand crafted pom pom tissue flowers add lots of color—and are really fun-n-easy to make. Mmmmm. 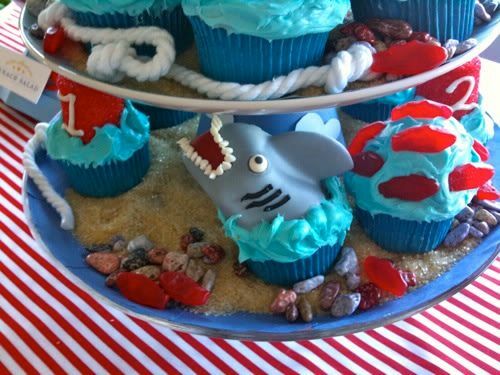 I love Swedish fish and these made a super cute cupcake topped—I think I might even like them better than the fancy shark! But of course the best part was little Sebastian himself, in his vintage sailor suit. HAPPY BIRTHDAY sweet Sebastian! Yer mama did ya proud! To see even more of this adorable party, please swing by Twig and Thistle. Everyone knows cupcakes are hot, but really nothing beats the most basic, delectable cookie. 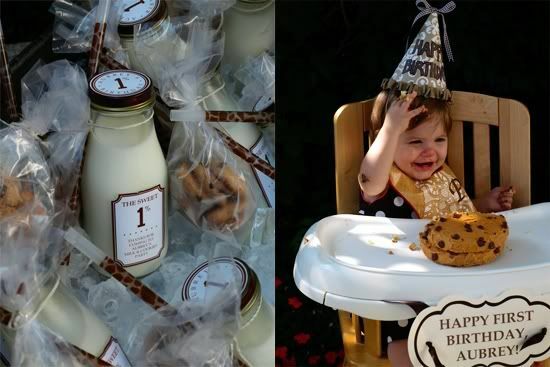 I’m really loving the new trend of throwing Milk & Cookie Parties and I was completely taken with Anne Power’s amazing First Birthday for her little girl Aubrey. 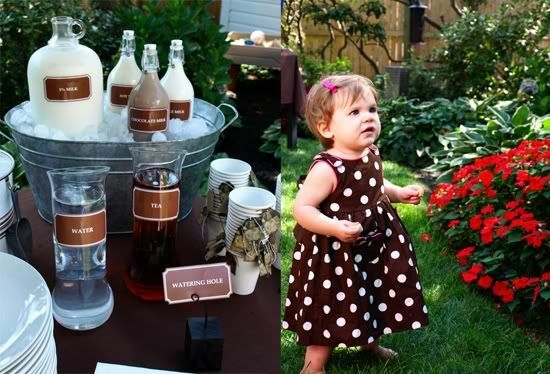 I thought this was an especially clever idea: the party favours were little mini Frappuccino bottles, turned into milk jugs—served on ice, of course. Also, can we please discuss how awesome Baby Aubrey’s mock-cookie “Smash Cake” is?? Anne offers up this great tip: LAMINATE all your bottle signage! When you’re tucking bottles into ice, the condensation will turn your labels to mush in no time. Mmmm. Is it wrong that when looking at all these pictures I just want to holler, “MMMMmmm COOKIE, cookie cookie cookie cookie!!! !” in a Cookie Monster voice?? Such a sweet day….and I have to say Anne’s little girl Aubrey is crazy cute—check her out in her little polka dot dressie! I think what I love best about this party is that you can go as fancy or as simple as you like. Sure the cake and all those details were spectacular, but you could easily create a totally delicious simple cookie bar with a big tub of mini milk cartons too. 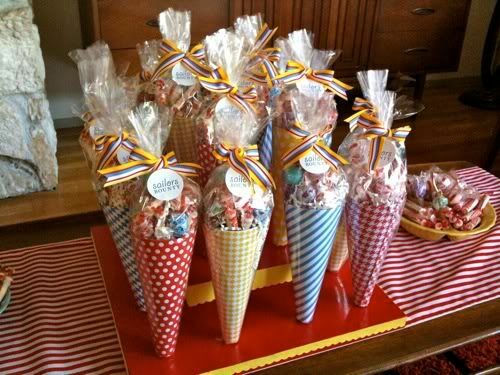 Have you thrown (or been to) any creative kiddo birthday parties lately? Please let us know! 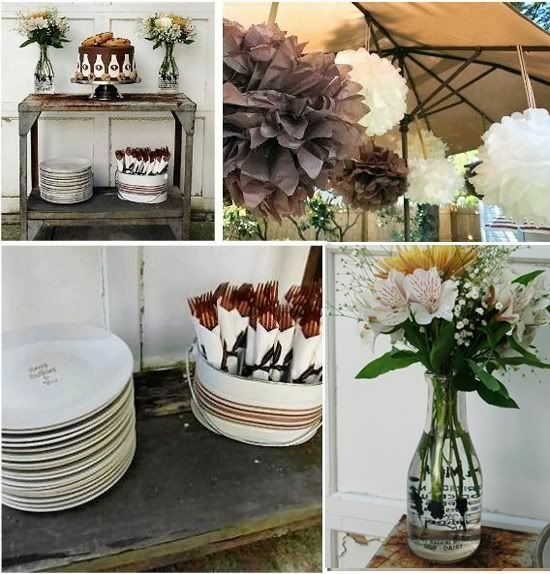 To see more of Anne’s fun designs, and get even more details on this party, be sure to swing by her blog A Party Style. Thank you Anne for sharing sweet Aubrey’s day with us. OH and PS…..don’t forget that this whole post is coming from the woman who SKIPPED HER SON’S BIRTHDAY THIS YEAR. Yes, poor Wolfie never had a party this year, so I’m officially giving you license to not do much of anything when that first birthday rolls around. I promise you, your bebe will NEVER remember….and when you tell him or her that you rented a flying dragon/unicorn for their first birthday, Dottie and I will TOTALLY back you up. Posted in Kiddo Parties, Widdle Wednesdays. Tagged with "milk and cookies", baby parties, birthday parties, first birthday, gorgeous first birthday, party. I was totally sweating anything to do with her first birthday (coming up soon!) because we’re going to be traveling that day! But I just bought her (and us) her first birthday present: upgrade to Economy Plus, first row, so she has the whole galley to wander around. And the next day, her cousin is in charge of the official family party, so I can’t wait to see what she comes up with. And that sailor suit? KILLS! you guys! i have a month to get tru and harry’s joint bday party together and i swear it’s going to be thrift store paper plates and each kid going home with a snickers bar. i am scared. these are too cute!! i bookmarked the pom poms. god help me. i am so OCD about vintage that i want to put a bib on that dear little sebastian! great parties! both are ideas i haven’t heard/thought of before…well done! i am pro-party. maybe a little too much! we just finished the bday crunch at my house. baby Mae’s 1st bday was bird themed…and a lot of the decor and favors were from the Easter aisles at Target! SCORE! (pics at my blog!) Miss Haven (who currently is shooting for a career as an elephant veterinarian) had a day at the theme park here in KC, then dinner with family at the Elephant Bar. and i am dying over those pom-poms! must buy tissue paper today!! 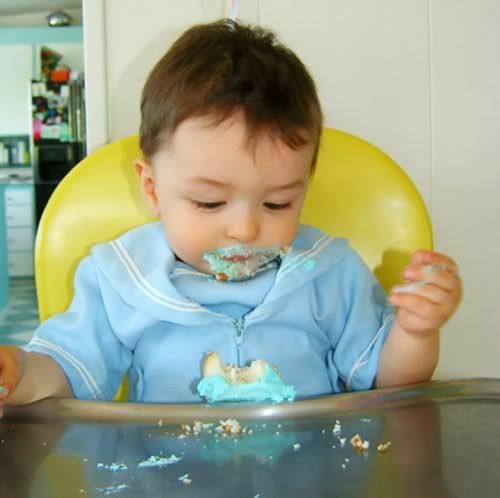 Um, is it wrong that I’m already thinking about my kid’s 1st birthday party when he’s not even born yet? I haven’t even finished the nursery yet! 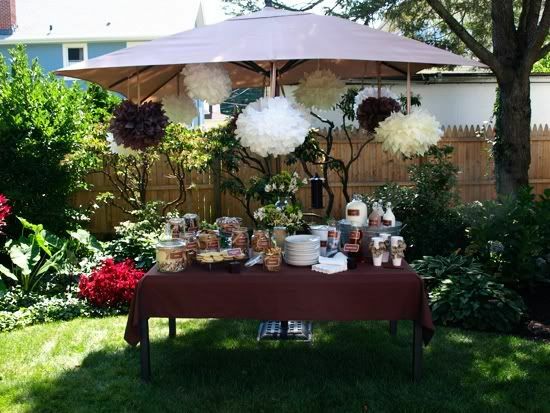 A couple of ideas that I’ve been toying with: “where the wild things are” theme, “red balloon” theme (both these themes have been featured on the blog party perfect), OR a vintage space/ray gun theme party! 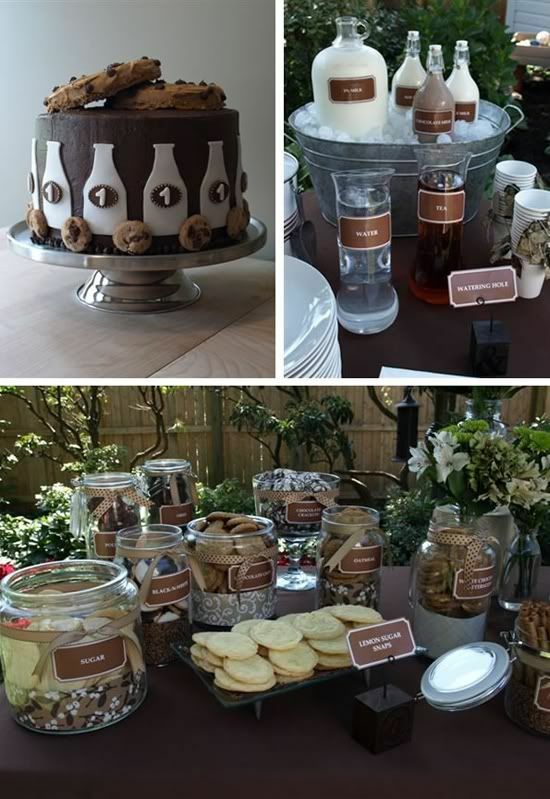 i have died and gone to heaven with the milk & cookies PARTY! OMG. soo many cute things up in there! can i have this for my next party plz?